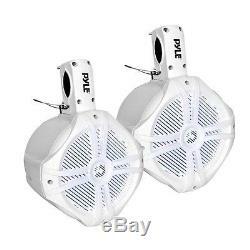 NEW Pyle PLMRWB65LEW Dual 6.5 Marine Tower Wakeboard Speakers LED Lights 200W. Marine Grade Water Resistant Housing. Sound: 6.5'' Speaker 1'' Dome Tweeter. Excellent for Monitor or Surround Sound Applications. Mounting Bracket and Hardware Included. Fits Mounting Bars up to 2.0'' in Diameter. Support Bar Tubing Frame Roll-Cage Mounting. Heavy Duty Engineered ABS Construction. Includes LED Lighting Remote Control Technical Specs. MAX Power Output: 200 Watt (RMS: 100 Watt). Frequency Response: 40Hz - 20kHz. Remote Control Battery Operated: Button Cell (CR2032). Dimensions (H x W x D): 8.5'' x 8.5'' x 9.0'. The item "NEW Pyle PLMRWB65LEW Dual 6.5 Marine Tower Wakeboard Speakers LED Lights 200W" is in sale since Monday, April 18, 2016. This item is in the category "Sporting Goods\Water Sports\Wakeboarding & Waterskiing\Other Wakeboarding/Waterskiing". The seller is "qualitycaraudio" and is located in Mountainville, New York. This item can be shipped to United States, Canada, United Kingdom, Denmark, Romania, Slovakia, Bulgaria, Czech republic, Finland, Hungary, Latvia, Lithuania, Malta, Estonia, Australia, Greece, Portugal, Cyprus, Slovenia, Japan, China, Sweden, South Korea, Indonesia, Taiwan, South africa, Thailand, Belgium, France, Hong Kong, Ireland, Netherlands, Poland, Spain, Italy, Germany, Austria, Russian federation, Israel, Mexico, New Zealand, Philippines, Singapore, Switzerland, Norway, Saudi arabia, Ukraine, United arab emirates, Qatar, Kuwait, Bahrain, Croatia, Malaysia, Brazil, Chile, Colombia, Costa rica, Dominican republic, Panama, Trinidad and tobago, Guatemala, El salvador, Honduras, Jamaica.